Some of the most luxurious, unique and creatively designed private island resorts in the world are located in the Maldives. The cluster of pristine, white-sand islands strung together in the north Indian Ocean are a magnet for those seeking the most exclusive island destinations. Corner-stones of the best of luxury Maldives holidays will be: an exquisitely-appointed, beach-front or over-water villa; a spa and wellness centre practising the latest treatments; the finest, Asian-fusion cuisine served in the most incredible locations and of course exemplary service from start to finish. Our carefully-selected, first-class, Maldives resorts have made it their raison d’être to create unforgettable holidays that relax every fibre of your being. Picture yourself stepping from your own infinity pool into the perfect, tropical waters to explore the teeming fish and turtles swimming below, later you might take a cruise on a private yacht and sip cocktails on the deck at sunset, and in the evening there’s amazing dining to be had in breath-taking surroundings. Welcome to the cream of the Maldives. There are many, many five-star Maldives resorts and trying to decide which to choose from can feel overwhelming, research isn’t easy and the most exclusive locations can be the most elusive! Our team have unrivalled, expert knowledge to help you find the genuine, luxury experience you’re looking for at a great price. 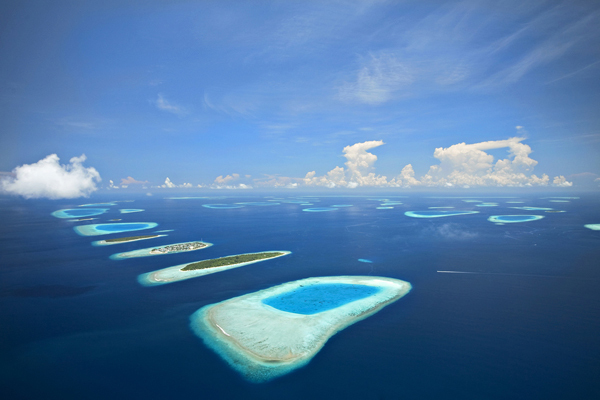 Calling one of our Indian Ocean experts makes your kind of luxury Maldives holidays that are just a plane ride away. Hudhuran Fushi Medium range All Inclusive with plenty of beach front rooms that are beautifully decorated. It is quite a busy hotel, popular swim up bar at the main pool. Water villa clients have their own very good dining area. Olhuveli Beach Upper range good for families and couples, lovely, large beach front rooms with private pools, excellent kids club, good beaches – beware of rooms that have not been refurbished and 2 levels of All Inclusive to discuss. 50 Minutes from Male by speedboat. Eriyadu Lower range very tiny – an 8 minute walk all the way round, simple beach side living with a no shoes approach to life. Very quiet but good food and beverage, super simple beach bar and lovely swimming. No over water villas 30 minute speed boat ride from male. Oblu by Atmosphere Upper range All Inclusive but still good value with excellent dining opportunities. Lovely beach side rooms, 1 hr speed boat ride from Male, very well run – you will love it. Excellent diving and snorkelling. Full Moon by Sheraton Upper range just 10 minutes away from Male, excellent all round hotel with wonderful beach accommodations – cottages and rooms. Great choice of restaurants and facilities. Very pretty and well run. Enjoyable evening music with DJ or band most nights.